Seadragon Backpackers i Brighton, England: Reservér nu! Cancellation policy is extended to one week. Seadragon Backpackers is a small hostel with just six rooms. 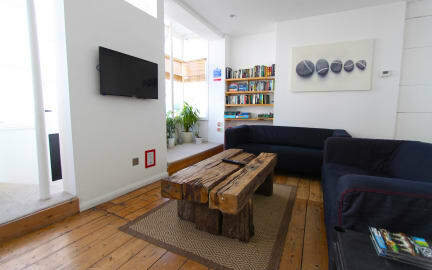 Set in a Regency building with tons of character and quirky corners we pride ourselves on offering a clean, well run hostel for those who visit our wonderful, vibrant city. 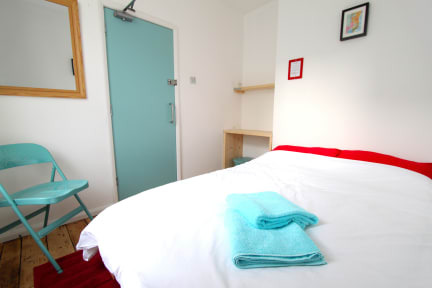 Our six rooms consist of 1 double room, 4 four bed mixed dorms and 1 mixed twin room. We have new wooden bunk beds (no squeaky metal here!) and they all have incredibly comfortable memory foam mattresses and great pillows. Our basement kitchen was voted by Lonely Planet as ‘Best Hostel Kitchen’ and is open all day and night. We have a huge fridge freezer, space to sit, eat and socialise with other guests, pots, pans and everything you need to cook – just as if you were at home and everything is kept clean at all times. Our cozy lounge is also open all day and night and there you will find television, games, book swap and comfy sofas. We provide linen and will make up the bed ready for your arrival, free towels on request, free WIFI throughout the building. We also include breakfast of eggs, cereals, breads, jams and tea and coffee. Tea and coffee is available all day, breakfast from 07:30 to 10.30. Our checkout time is 11:30 and check in time is from 2pm. We are a ten minute walk from the city centre and just 30 seconds from the seafront. Right around the corner from us you will find 24 hour supermarkets and convenience stores as well as late night food places and plenty of awesome pubs. Brighton train and bus stations are also nearby.